As far back as we can remember, people have been throwing coins into fountains seemingly as long as there have been coins and fountains. The tradition all started with water. Water is vital to means of sustenance to human life. While many people in the developed world today have clean, drinkable water readily available from their kitchen taps, this was not always the case in olden times. Drinking holes in many regions weren’t the easiest things to find when looking for a place to drink. Therefore, where clean water was available, many early European tribes believed that such areas were a gift from the gods. One of the most famous wishing fountains is the Trevi Fountain in Rome. 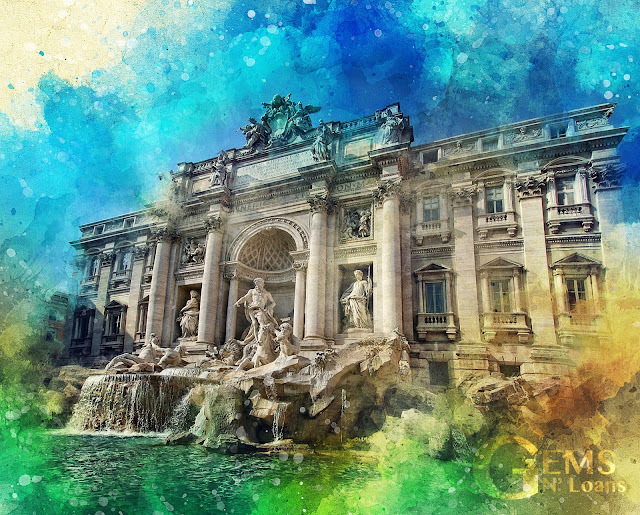 The Trevi Fountain was built as the ending point of a 21 kilometre long aqueduct called Virgo, named for the goddess who would guide soldiers to water when they were thirsty and tired. Originally, tossing a coin in or taking a drink from the fountain was supposed to ensure good health. Eventually, the tradition evolved to what we know today! While we don’t expect people to throw away their gold and silver coins in Dana Point, we wish for them to build financial portfolios and expand on their monetary wealth. At Gems N’ Loans we are here to help guide you along and get the most for your money whether buying or selling!